The work shown here is from far western China. You probably have seen photographs recently touting the dazzling new structures going up in preparation for the Olympics. Aric’s work reminds us that, away from the spectacle, ethnic repression is still a fact of life for some in China today. 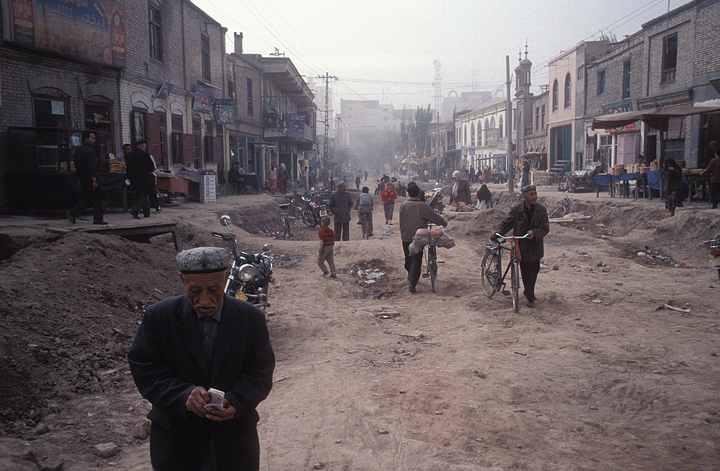 An elderly man counts his money from the morning market in Kashgar. 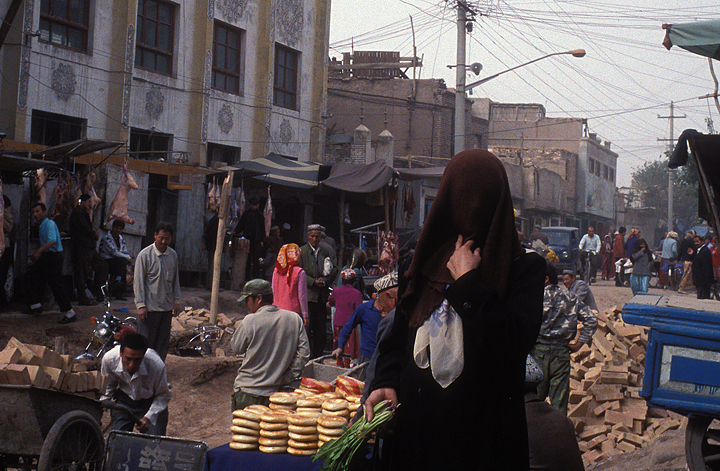 Kashgar is the largest trading town on the Silk Road in China. The Uygur have been doing business here for centuries. A woman wears a traditional Uygur veil in the old section of Kashgar. The Uygur practise a unique brand of Islam, partly their own and partly under the control of the Chinese government. 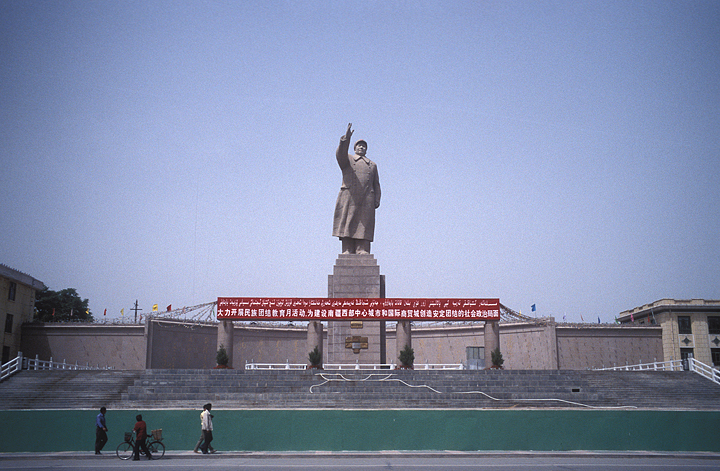 A 59 feet tall statue of Chairman Mao dominates the square in the center of Kashgar. As throughout China, much of the town has been torn down to make way for broad boulevards and big squares. The poorest sections of town are left alone. What is left of the original culture is often turned into theme park like tourist attractions. 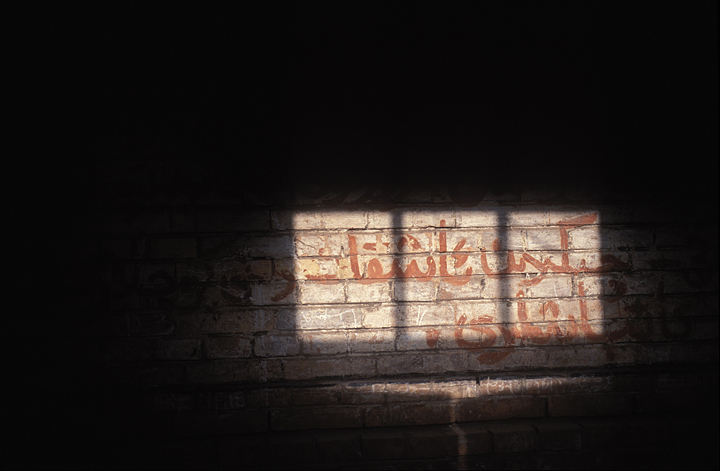 Light from a door illuminates text on a wall. The Uygur language is written in an Arabesque script. The Uygur guard their cultural heritage from assimilation into Chinese culture. Too often this forces them to chose between adopting the Chinese language and mannerisms for the economic opportunities that come with them, or staying with their Uygur heritage. 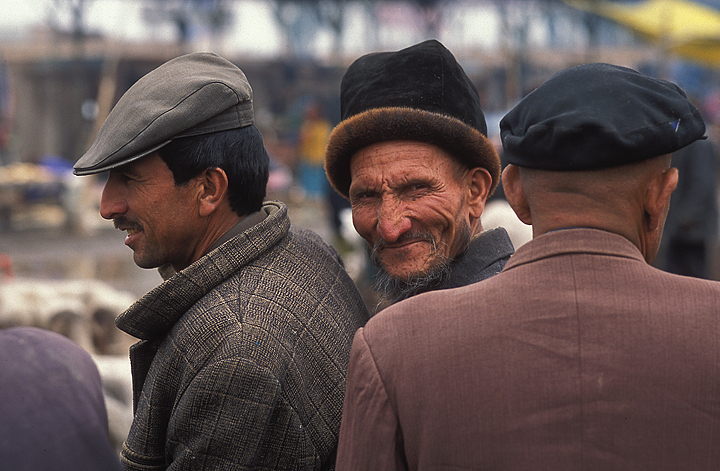 Uygur men at the livestock market in Kashgar. The Uygur are an ethnic minority in China. They trace their heritage back for 5,000 years in this part of the world. They speak an Arabic language, have their own Arabesque alphabet and have distinctly different features from the Chinese. 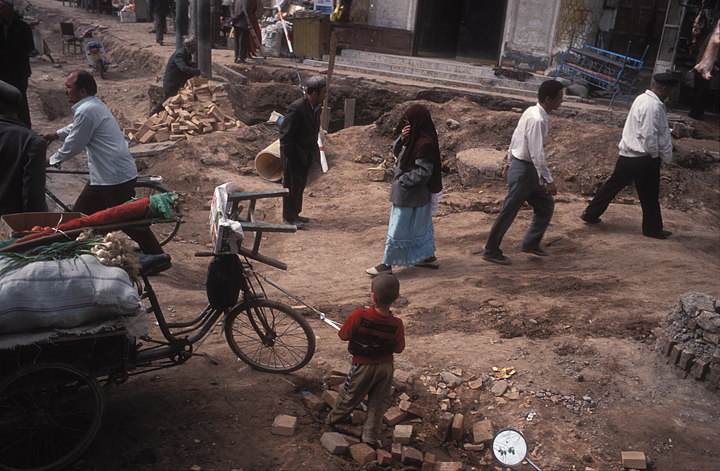 A Uygur boy helps to move the day’s goods to and from the market. 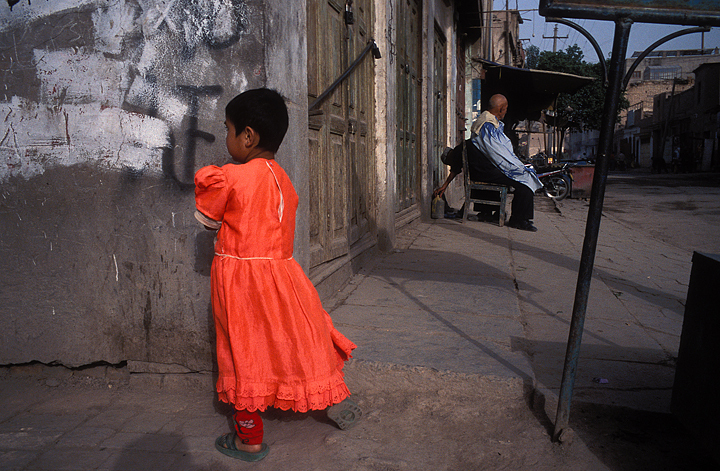 A Uygur girl heads to the market in a silk dress in Kashgar. 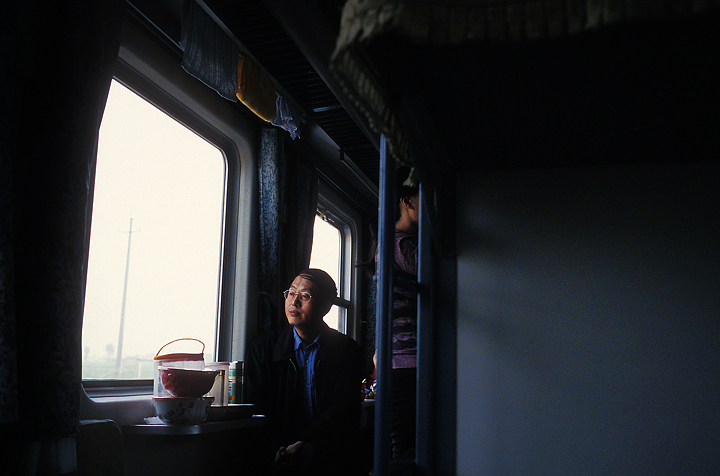 A Han businessman travels west by train from Beijing. He is heading to Urumqi in Xingiang, on the Northern side of the Taklamakan desert. With a population of 1.5 million, Urumqi is a fast growing business center for western China. Lucrative contracts are given to Han business owners, encouraging investment and immigration from the east. Many Uygur are left behind in this economic boom. Next Post →Sight Gag: Pimp My Blimp! “They speak an Arabic language”???????? I think you mean a “Turkish language”.